On an overcast day, the assembled birders were treated to a raptor show within the first half hour of our monthly walk at Malibu. 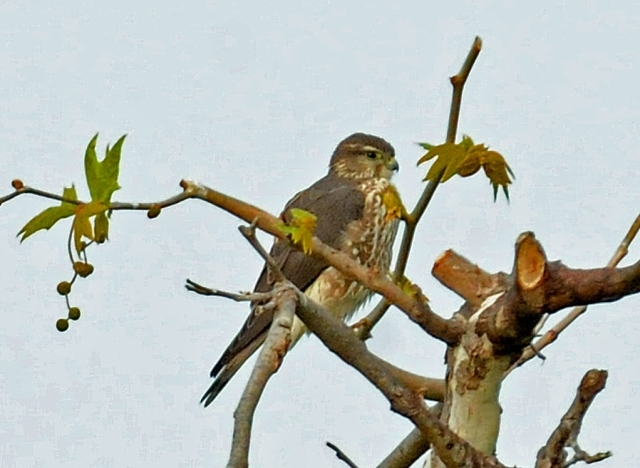 A Merlin perched on a sycamore long enough for our expert Jim Kenney to snap his portrait. Soon after, the Peregrine Falcon, reported earlier by other birders at nearby Legacy Park, scattered the gulls in the lagoon as he made a quick pass at the available food supply. After the group took a long look at the ducks and coots from the east observation deck, we were stopped along the wall to the private golf course by an Osprey and a Red-shouldered Hawk perched only a few feet from each other in one of the tall sycamores. Who needs more excitement? Our only “miss” was the White-tailed Kite. Our two unusual sightings for the day were a male Redhead seen under the bridge and a Hermit Thrush that re-appeared a number of times on one of the Malibu Colony fences. Birds new for the season were: Black-vented Shearwater; Herring & Glaucous-winged Gulls; Cassin’s Kingbird; Hermit Thrush and (gasp!) House Sparrow. We rarely see House Sparrow at the lagoon although they’re all over the shopping area across the highway. Our next three scheduled field trips: San Jacinto Wildlife Refuge (Riverside County), 15 Feb, 8:30am; Malibu Lagoon, 23 Feb, 8:30 & 10am; Hiker Lu’s Santa Monica Mountains adventure, 8 Mar, 8:30am. Our next program: Tuesday, 4 Mar., 7:30 pm. Antarctica: your next shopping destination, presented by Chuck Bragg. NOTE: Our 10 a.m. Parent’s & Kids Birdwalk meets at the shaded viewing area. Total Birds: January total birds of 834 is 62% below the 6-year Jan. average, due primarily to the absence of gulls and terns scattered by the Peregrine Falcon before they were counted. Summary of total birds from the 6-year average so far: Jun’12 +36%, Jul’12 -9%, Aug’12 -9%, Sep’12 +12%, Oct’12 +3%, Nov’12 -5%, Dec’12 +30%, Jan’13 -20%, Feb’13 -29%, Mar’13 -30%, Apr’13 -34%, May’13 -37%, Jun’13 -24%, Jul’13 +83%, Aug’13 +37%, Sep’13 +23%, Oct’13 +41%, Nov’13 -58%, Dec’13 -49%, Jan’14 -62%. Species Diversity: January 2014 with 63 species was slightly below (-2%) the 6-year average of 64.2. Summary of species diversity from the 6-year average so far: Jun’12 -10%, Jul’12 +10%, Aug’12. -6%, Sep’12 -20%, Oct’12 +5%, Nov’12 +2%, Dec’12 -4%, Jan’13 +2%, Feb’13 -8%, Mar’13 +9%, Apr’13 -2%, May’13 +3%, Jun’13 +13%, Jul’13 0%, Aug’13 +11%, Sep’13 -14%, Oct’13 +19%, Nov’13 -3%, Dec’13 -6%, Jan’14 -2%. Tide Lo/Hi Height H+5.9 L+0.65 H+4.94 H+6.49 H+5.76 L-0.17 Ave. Totals by Type 1/25 1/24 1/23 1/22 1/27 1/26 Ave.
Total Species 1/25 1/24 1/23 1/22 1/27 1/26 Ave.